Enjoy a modest, affordable, fun and exciting vacation at the lake! 2 Br/ 1 Bath - Clean / Quiet / Comfortable! Welcome to Whispering Winds! This 2-bedroom 1-bath sleeps up to 6 people. Intimate and cozy, this all-you-need rental has all you need especially because you will be spending so much time at Arrowhead Lake, the 3 heated outdoor pools, (this rental is WALKING distance to Choctaw Pool!) community center, outside sports, biking, hiking, and exploring the natural area! This vacation destination is a short drive to the amenities AND area attractions! In the winter months Whispering Winds is ideal because of its close proximity to Jack Frost & Big Boulder Ski Resort! This home is accommodating for a small family or couple retreat & great for any time of year! Whispering Winds is an all you need rental to provide an exciting local experience in The Pocono Mountains! The first thing you notice is a long spacious deck that allows for night time life. The outdoor patio makes an ideal setting for relaxing, spending time with friends, families, and loved ones. You can grill juicy steaks or burgers as you look into the clear night sky surrounded by trees and away from city noise! As you step into this single level cozy 640 square-foot home you can see the living room and kitchen are close in proximity. The kitchen includes a variety of appliances and you can show off your cooking skills to friends and family! You can prepare a delicious and memorable meal and bake a mouthwatering cake in our oven! 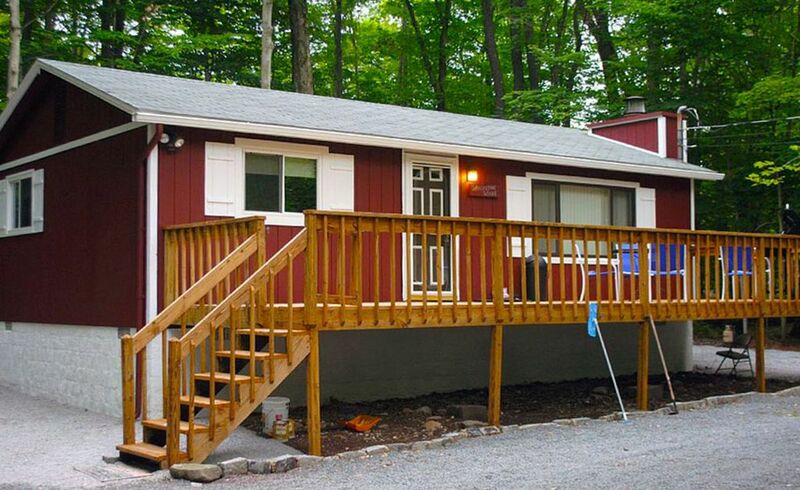 This rental is the perfect size for families looking for a modest vacation, providing just the right amount of accommodations, as you will be spending A LOT of time at the lake, the 3 outdoor heated pools, biking, fishing, and checking out the local Pocono Mountain life and attractions! Arrowhead Lake Community is a gold star gated community that is private and secure. Life at the lake provides access to family amenities in addition to natural and peaceful surroundings. Arrowhead Lake has 3 heated outdoor pools, sports, fitness center, fishing, boating, and more! Whispering Winds is conveniently located by many of our natural, local, and exciting area attractions only minutes away from this home! Some of our local attractions include golfing, skiing, waterparks, shopping outlets, dams, rivers, and hiking trails! This property is in quiet location perfect for solitude and escaping from the noise of the city. Quiet & Intimate, all you need space. Spacious deck in the front of house. Great for entertainment & more. Arrowhead Has 3 outdoor heated pools. The Choctaw pool is a 5 min walk! Overall we had a great stay weather wasn't on our side but the place it self was clean and perfect size for our Family of 4. I do have 2 suggestions 1) it would be nice have an address or street name for places like the Lodge ect. 2) if staying here I would suggest washing the towels the night before check out due to washer/dryer are kinda small and it take a while to dry them. It is quite clean nice place to be . We had a wonderful stay in Whispering winds with our five year old and twin toddlers! Barbara was a wonderful host, leaving us a lovely welcome basket of treats and going out of her way to make sure everything was just right. It's a small space, but we spent most of the time outside and enjoyed our meals on the deck. The small kitchen was well stocked, and the house, while simple, had everything we needed. Arrowhead Lake is a lovely location and we also enjoyed walking to the pool and going to the lake, a short drive away. We would definitely stay here again! Beautiful cozy little place. Makes you feel right at home, was able to find averything I needed for my stay! Te people were very profesional and helpful! Visited cuople water parks that were about 30 minutes away not bad at all. Will definitely rent again and recommend this place and people to anyone.